I confess that I tried to use professionally, but today I could not. I do take loopy on to stage playing guitar with a FCB1010 connected. It still has some inconveniences which hopefully will be fixed soon, but its a solid program and hasn't let me down on stage. How come you could not? Hi @Tom, do you use FCB1010 via usb, right? and audio in / audio is via mic / headphones plug? I still do not trust Loopy, it requires extensive data processing and occasionally loses midi sync with other apps and even external drum machines (tried with the boss dr-3)​​. The visual idea of the app is very smart and practical, but it does not work 100% gets complicated for live performances. I broke an ipod touch 4, after an iphone 4s, ipad min and now an ipad mini retina believing it would only issue processing (hardware). Maybe you are being too picky, but live has no Ctrl + Z. If something goes wrong, it's gone. Just for fun. It needs higher bit/sample-rate and multiple outputs which are not 'priorities'. I'm regularly using it live and it's working great. Stereo outs is all I'd need for live looping gigs. Deb, with sample rate and multiple outs are you thinking recording projects? I must admit I'm not interested in midi sync though. That does seem to be a sticking point for some and perhaps across more iOS stuff than just Loopy. Loopy HD has great qualities, but can not synchronize a midi drums I found disappointing. Diy'm augmenting a foot controller with 15 buttons for use with pre-recorded drum tracks with different dynamics. 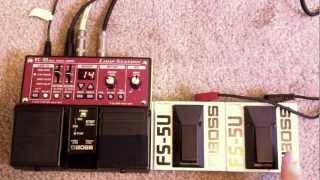 I want to make something beautiful to hear, feeling safety in the system as loopy felt with boss rc-300. Loopy DrumPerfect and form the perfect duo because DP has feature randomly change the beats which enriches and not tired of hearing. Already a drum tracks will always be exactly the same. What becomes monotonous and boring. I do not know what kind of sound you make. I use a Roland Gr-55 and a hybrid guitar with 8 strings (3 bass) and the sound is rich, full of possibilities. I just wanted to enjoy it all at its maximum. @deb could you just save a session and then dump the individual loops to a DAW later? More fiddly, I know. @Tom & @Ronaldo I also use the FCB1010. I've found my favorite results using an audio dock (Alesis IO Dock or Behringer Dock), plugging the FCB to MIDI IN on the dock. Here's another handy way if you'd rather not use a dock... Get a 3X USB to iPad adapter, a Griffin iMic, and a USB MIDI interface. The iMic is stereo in & out (selectable mic/line level) and you can use both a MIDI keyboard and the FCB simultaneously (via the MIDI THRU on the FCB). . It's a cheaper way to do it, and it hasn't failed me yet. Have fun! I do use Loopy HD live for gigs, also for building & mixing songs, it is great to recall songs on-the-spot and save those ideas that come while playing live. @Ronaldo I use an iRig MIDI to connect the FCB1010, and a iRig alternative (Cherub GB2I) for the audio input into the headphone socket of my iPod. I don't use midi sync, as i just loop my guitar with loopy, which never given me any problems. The only complaint i could give is that the FCB1010 seldomly sends a double signal when pressed, which will likely screw up the whole session. But possibly Midibridge can have a solution to this. Personally i don't need an "undo" function (can imagine it will be hard for Michael to correctly implement too). The "rerecord" is the live safer for me already. I use different layers of drums imported from Drumjam, to have some variety live. @ Cubilas Hi, thank you for the suggestion, but no longer have the Griffin iMic here in Brazil for sale. I am searching for similar products. I see many Loopers on youtube, homemade and professional, just the 12 tracks of Loopy and many other advantages, but 90% still use a Boss Loop Station or similar. I wonder why? I've used loopy for over 25 gigs, and have only had one time where it gave me a hard time. Since I switched to iPad Mini, the problems have no occurred. The reason people still use the hardware versions is because of familiarity and stability. Those things don't fail and require less of a setup. Loopy can be used by people who play out live all the time. Hi @ABrokenRecord, I migrated the ipod4 -> iPhone 4s -> ipad mini -> ipad mini retina. The problem of lack of midi sync with Loppy remains, even with external hardware such as a boss dr-3. I have a very extensive setup. I control loopy through the FCB1010 and a NanoKontrol (for volume, pan, solo, mute, etc). I run it through my Edirol Ua25-EX Soundcard to my iPad. I have a little mixer that runs into my Soundcard and then the outs on the Soundcard to PA. On top of that, I use a line6 MM4 and DL4, MicroPog, and Micro Q-Tron with guitar and the Voicalive App and my 5s for vocals. I also run a Handsonic into the mixer as well. I am working on some basic videos right now of my duo (the other guy plays a Roland GR55 Midi-enable Guitar). You can do some amazing things with loopy and it will hopefully only get better in the future. Yes, your setup is quite complex. Congratulations. I had a Handsonic HP10 and is very good. Yes, when publishing the videos, let us know the links. Be greatly appreciated. Hello Tom, you are also well equipped. And their sound is very cool. I want to walk to the side of simple. The less cables and devices I have to use the better. My project is to travel the Brazil playing in every city we go. So something lean and reliable is needed. As much as i love Loopy, for travelling i can still recommend using this. Loopy gives you more possibilities, more things to play with, more advanced features. But if you want something solid, fail proof and portable, the RC-30 is a good option. Although, loopy with a softstep is quite portable, you will need power for the softstep though. yes @Tom, I just bought another rc-300 again. Yeah, I agree about the RC300. I love mine. But Loopy is still cool and fun. Does anybody know if it can be used single track mode like the RC300? I don't always want simultaneity. I want to be able to switch tracks in time. I have a Blueboard by IK. Multimedia. This is all so fun!! that's. I posted about this the other day. Apparently the change in groups is not yet possible. @Tom Yes my FCB has the UNO chip, it was installed by the previous owner. Have never tried the original firmware. Awesome setup by the way. There are drum tracks in Loopy - press and hold an empty slot. import shows up, browse for a drum you want. The stock list is limited, I built a few in garageband, then use the iTunes file sharing function to import them into loopy. But it's frustrating when I just want to play music, not muck around with software..
Oh wow, thanks matcaird! Another example of RTFM LOL I just tried it, and it seems to work perfectly (limited testing, but looks good). What threw me off was the complaints about syncing, which of course is a different thing altogether. 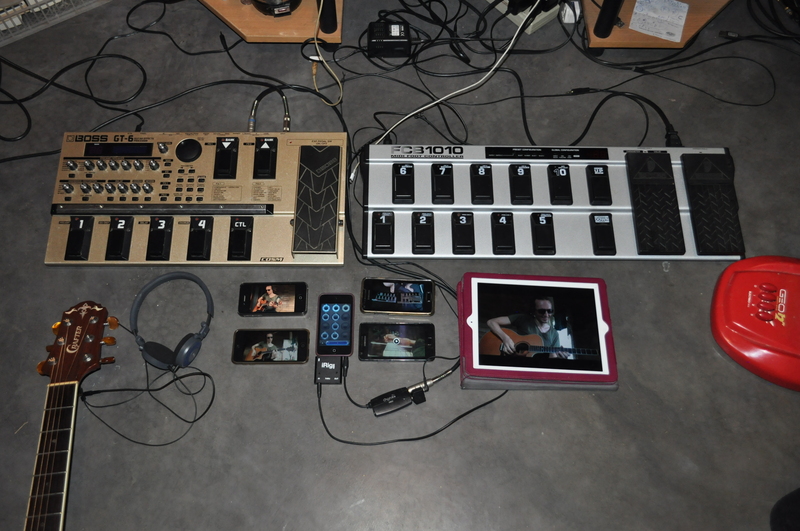 I am planning to play live with Loopy. It is stable for the most part, but occassional freezes or a crackling now and then still annoy me big time. I have an iPad Retina, so no idea why I am still experiencing these things. Just using JamUp (input) and Turnado (effect slot) together with Loopy. Removing Turnado has increased stability, but I really really want to use Turnado too...hopefully future updates of all apps will make everything more stable. Just for fun. I bought Loopy HD over an RC-505 or using a pedal with my Octatrack, it's pretty easy using it with my OP-1. A little more hokey to set up with effects, but vastly more portable. Turnado and JamUp are both pretty heavy CPU apps @elmrule. I've seen JamUp crackle on a jailbroken 5S just by itself (it doesn't like jailbroken devices, and performs better on an unmodified phone, but still...). Crackles generally mean the CPU is having trouble keeping up with the demand being placed on it. I've never had crackle issues in a simple audiobus chain with guitar>Jamup>loopy. That was even true when I was on a iPad 2. For stability you do have to be in airplane mode and manually close all other apps. about the original question: playing pro is still a distant dream, though if I ever did, I would definitely use Loopy. I had crackle city on iPad 3 whenever switching apps into the forefront. I would avoid iPad 3 like the plague. There is a reason apple dumped that one. IMHO, something is terribly off with the screen resources. Since moving to air it has been night and day difference. You got that right - I develop on an iPad 3 because it's one of the worst devices for music; gives me a decent baseline.